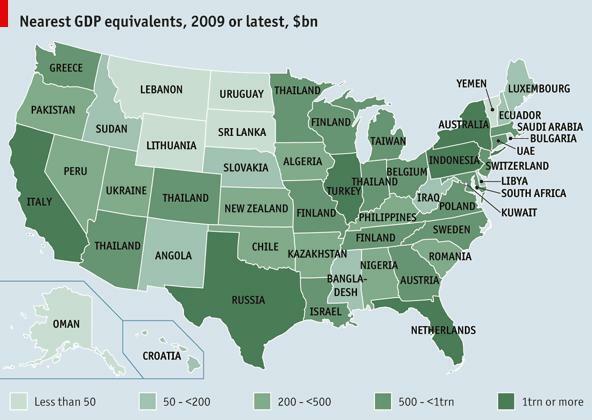 The Economist  magazine has a terrific map showing for each state the country it comes closest to in terms of GDP. The magazine’s online edition has an interactive map  with the actual numbers, as well as an option to look at population rather than GDP. Surprise: Oregon is about the same size as Pakistan? I wouldn’t have guessed. Then I looked at Washington State, which is about the size of Greece. And now I know that Greece’s economy is larger than Pakistan’s.